Have you ever heard of Meniere’s disease before? It is an inner ear disorder which affects about one percent of folks living in the US, and is a particularly disabling condition since attacks of vertigo can occur without any prior warning. In order to treat it, ordinary folks are required to lay still for several hours at a time before they can get back on their feet again. Since it strikes like a thief in the night, this ever-present possibility will inevitable cause sufferers to avoid certain activities, situations and perhaps, even careers. Both medication and lifestyle changes will do their bit to alleviate the situation, but it will not solve it completely. Of course, there is always the alternative to go under the knife, but that typically results in depleted hearing and/or balance functions of the affected ear. Good thing for progress though as a team of scientists from the University of Washington Medical Center are currently working on a new cochlear implant on their first human test subject. The main idea? 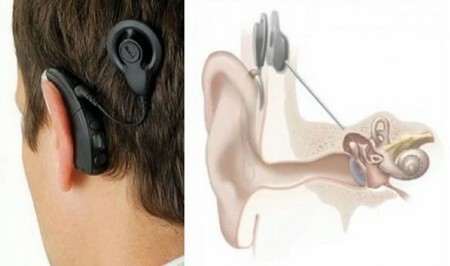 To remove the patient’s symptoms without sacrificing functionality in either ear. Meniere’s disease is yet to be understood in its entirety, although its attacks are widely believed to be caused by the rupture of an inner-ear membrane. This results in fluid leaking out of its vestibular system, which will subsequently throw off the brain’s sense of balance. Thanks to the new intended method of treatment, the implant will be surgically placed in a small well created in the skull’s temporal bone which is located right behind the patient’s ear. A trio of electrodes will extend from it, right into the canals of the inner ear’s bony labyrinth. All patients will have different placement spots since they must be individually recognized via neuronal signal testing. Not only that, the patient also wears a small external processor behind their ear, which will line up directly with the implant. Whenever the wearer feels an impending attack, all they need to do is activate the processor tosends a signal to the implant, which results in transmitting electrical impulses via the three electrodes. These impulses will override the malfunctions in the inner ear, enabling the patient to maintain balance until the attack passes. Sounds pretty neat! This device was four years in the making, and recently received the nod of approval from the FDA.